The aim of the Arctic charr and salmonid group at the University of Iceland, led by professor Sigurður S. Snorrason, is to investigate the genetic and developmental mechanisms underlying the rapid and repeated evolution of diverse ecological adaptations in Arctic charr (Salvelinus alpinus) and the phenotypic and genetic diversity among Brown trout (Salmo trutta) populations in Iceland. How flexible are the ecologically important traits of colonizing species? What is the role of isolation, adaptation and gene flow for diversification in novel habitats? What are the molecular underpinnings of parallel evolution? Do the same pathways, genes or even alleles contribute to divergence in multiple isolated populations within a species? After the end of the last ice age, about ten thousand years ago, Arctic charr and Brown trout invaded and colonized multiple habitats in Iceland. Ecological studies on Arctic charr have shown extensive polymorphism in trophic morphology and life history. In some cases distinct morphs are found in sympatry, such as in Lake Thingvallavatn. Population genetic analyses and ecological studies indicate parallel evolution of a small benthic form, where ecologically processes have led to morphological divergence which may be considered the initial steps of adaptive speciation. Pictured are the four charr morphs of lake Thingvallavatn, drawn by Eggert Petursson. PI: piscivorous, LB: large benthic, PL: planktivorous and SB: small benthic charr. The overall aim of the arctic charr projects: To understand how diverse arctic charr populations have evolved in Iceland since the last Ice Age and to investigate mechanisms associated with morph formation and ecological divergence. The group is also investigating Brown trout, with the the main objective to map the phenotypic variation in Icelandic Brown trout with respect to key ecological correlates and to employ population genomics to cast light on the processes of diversification. implicate loci that may associate with morphological and ecological characteristics and assess if and how variation at these loci correlates with ecological specializations across multiple populations. The group involves several researchers: Sigurður S. Snorrason (ecology/development), Zophonías O. Jónsson (molecular genetics), Arnar Pálsson (evolutionary genetics), Sigríður Rut Franzdóttir (development/molecular biology), Kalina H. Kapralova (morphometrics and molecular biology), Sarah E. Steele (geometric morphometrics of plasticity) and Valerie H. Maier (molecular biology/immunology) which are responsible for distinct aspects of the project. Ph.D. students Jóhannes Guðbrandsson, Han Xiao and Marcos Lagunas, Sebastian Matloz, Quentin Horta work on the project. Several bachelor students and interns also contribute. 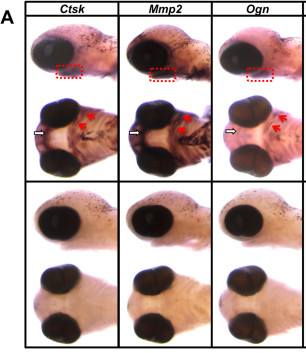 The picture is from Ahi et al 2014, demonstrating spatial expression of 3 genes in early charr development. The main collaborators are Skúli Skúlason and Bjarni Kr. Kristjánsson at Holar University College, Moira Ferguson at Guelph University and Ian. A. Johnston at St Andrews University. Gudbrandsson et al. (2018) Differential gene expression during early development in recently evolved and sympatric Arctic charr morphs. Gudbrandsson et al. (2016) The developmental transcriptome of contrasting Arctic charr (Salvelinus alpinus) morphs [version 2; referees: 2 approved, 1 approved with reservations] F1000research. Kapralova KH, Jónsson ZO, Palsson A, Franzdóttir SR, le Deuff S, Kristjánsson BK, Snorrason SS. 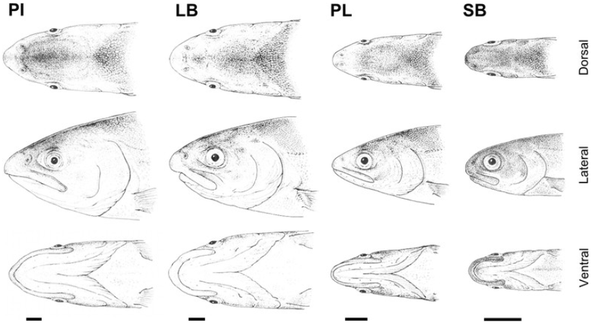 Bones in motion: Ontogeny of craniofacial development in sympatric arctic charr morphs. Dev Dyn. 2015 Jul 6. doi: 10.1002/dvdy.24302. Gretar Guðmundsson - M.Sc. 2019. Lieke Ponsioen - internship 2017/2018. Ehsan Pashay Ahi - Ph.D. 2016. Þóra Margrét Bergsveinsdóttir, B.S. project 2016. Völundur Hafstað, B.S. project 2016. Jovita Navikaitė - internship 2016. Sebastian Matloz - internship 2016. Freya M. O'Sullivan - B.Sc. project 2016. Jeremy Jaegers - internship 2015. Sophie S. Steinhauser - B.Sc. project 2014. Sara Eiríksdóttir Andersen - B.Sc. project 2014. Isak M. Johannesson - summer project 2014. Baldur Kristjansson - B.Sc. project 2012. Vanessa C. Baltanas - B.Sc. project 2011. Christina B. Santos - B.Sc. project 2010. Javier N. Escudero - B.Sc. project 2011. Marta Munoz - B.Sc. project 2009. Rannis, Icelandic research fund: 5 grants. University of Iceland research fund. University of Iceland doctoral student fund.